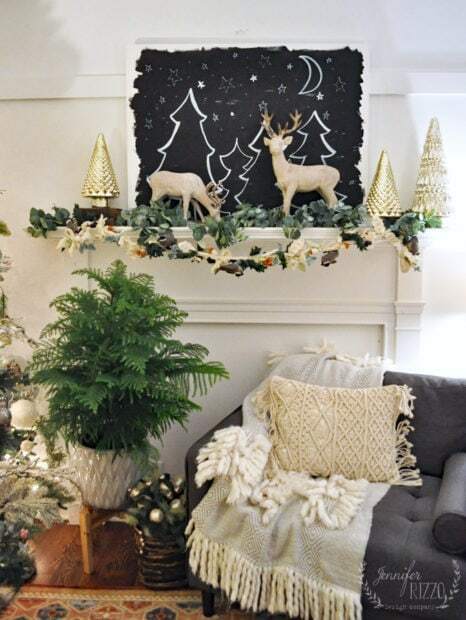 I’m excited to share my winter wonderland, woodland fireplace mantel and tree,with a winter night painted canvas decor to share with you! But first, can you believe it’s almost December??? My annual Holiday Housewalk is almost here, and Christmas is right around the corner. The time has flown by. Of course, since I live in retailland, we’ve actually been doing the holiday thing since our first shipment came in August. At least now, I can actually put up some of my own Christmas decorating, and my neighbors won’t think the cheese has completely slid off my cracker! 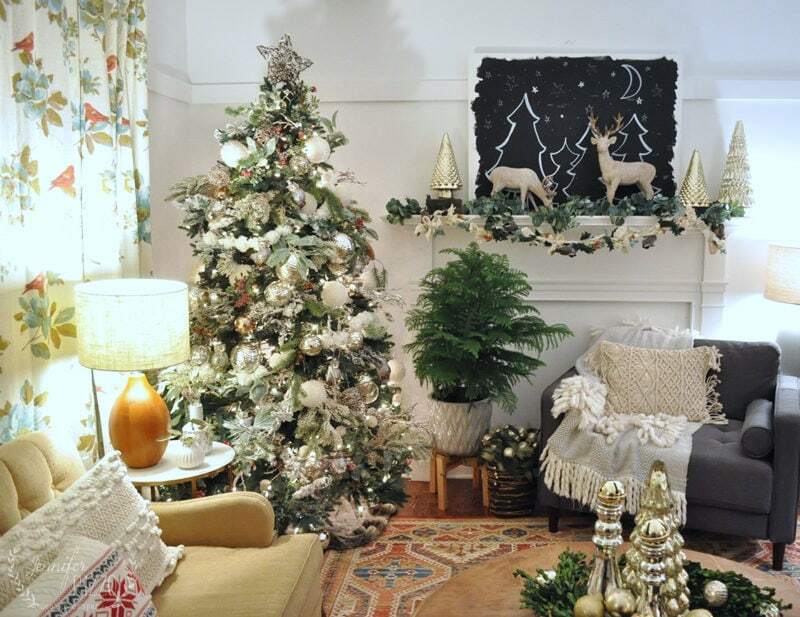 I’m joining my friends from the Season’s of Home holiday series again to share our holiday decor with you. I put my woodland-themed tree up again this year, since I loved it so much last year, and I incorporated my deer from my rustic mantel a few years ago. This year, instead of the old mirror I had up there, I’ve been changing out my art, and decided to make Winter Night Painted Canvas decor this year. I loved the idea of the deer hanging out under the stars and the moon. 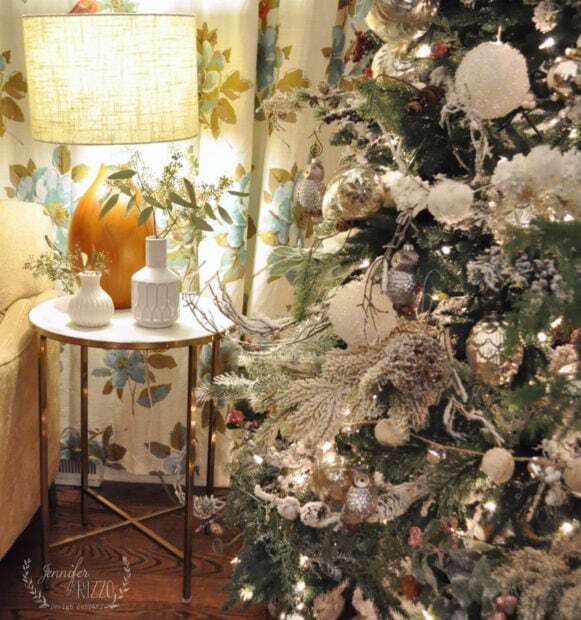 I added some mercury glass trees from Homegoods to my mantel, and that cute tree is a live tree! It’s called a Norfolk Pine. I picked it up from the grocery store for about $24! I thought it was such a great touch of live green to my decor. 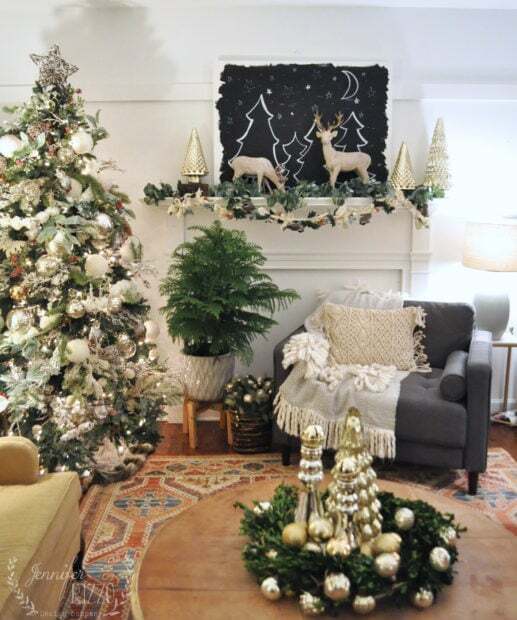 I love using live greenery, like last year when I went a little Scandinavian, and put these live trees on my mantel in water. 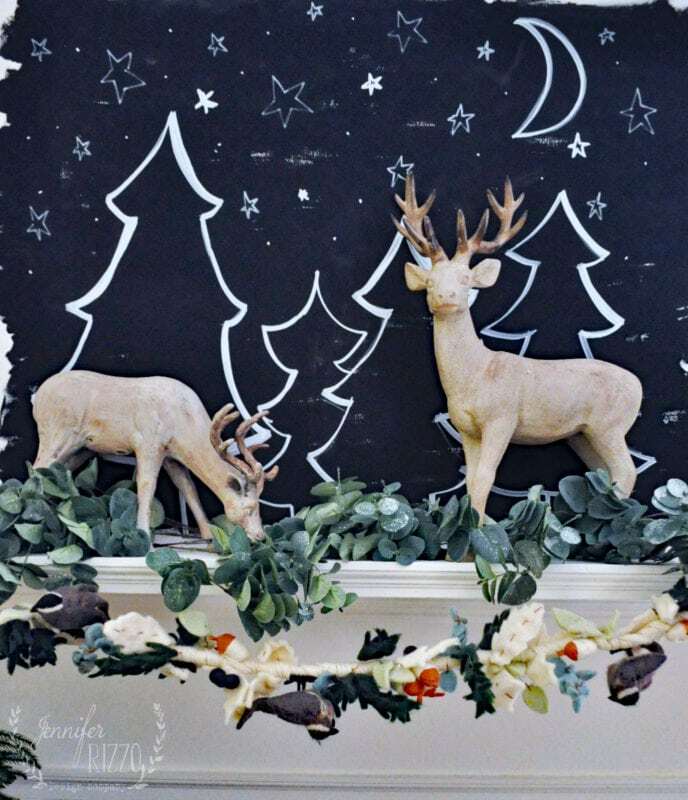 I painted the large canvas in DecoArt’s chalky finish paint, and used white paint to make the tree images, as a winter wonderland back drop for my deer. The deer are also hanging out with some faux eucalyptus, and a fun felted garland from Anthropologie I bought a few years ago. My tree is just a plain, green tree from Balsam Hill that I tuck snowy branches into. 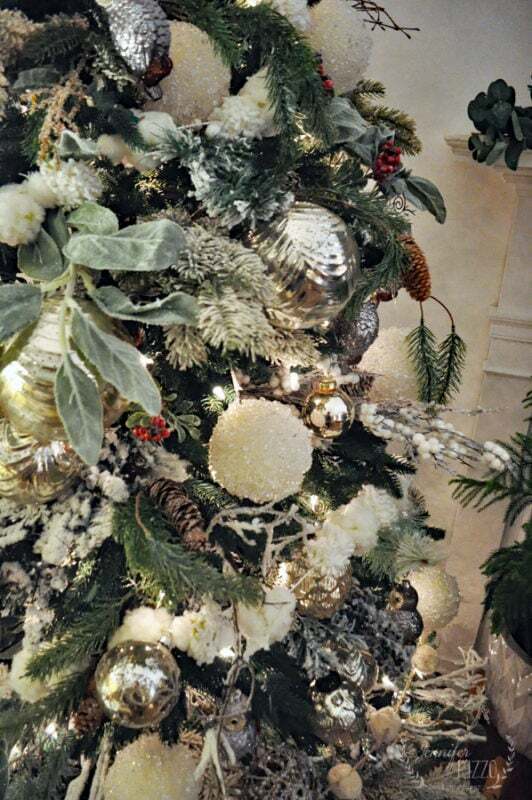 It makes it look like a flocked tree with out the expense. I’ve kept the other side of the room simple, with a few sprigs of fresh Eucalyptus,in pretty white vases. 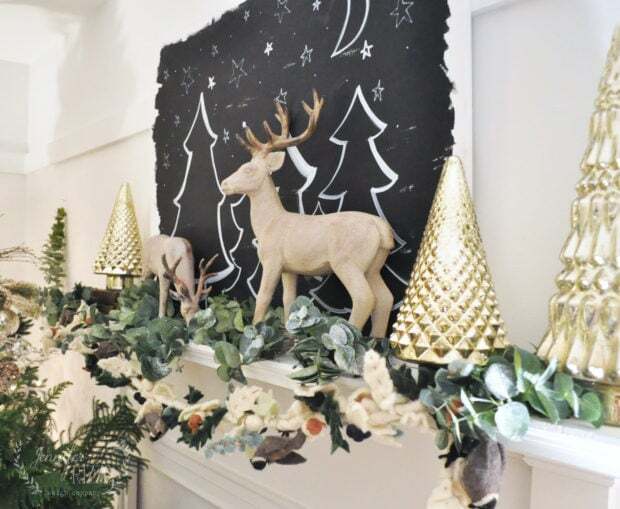 And make sure you visit the other bloggers, and see their fun, and festive decorating too!